Sonia Rykiel was established in 1968 and has continued to charm and delight with distinctive designs that are eclectic and dynamic, displaying contemporary illustrations with vibrant use of colour. 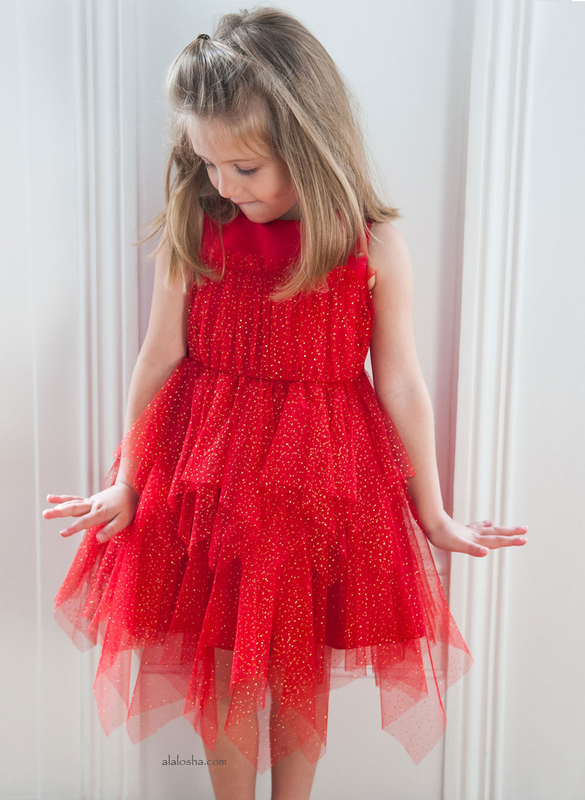 In 1983, the brand’s childrenswear line Rykiel Enfant came to be under the creative eye of daughter Nathalie Rykiel. “I was pregnant with my eldest daughter and I couldn’t find anything that I liked”. 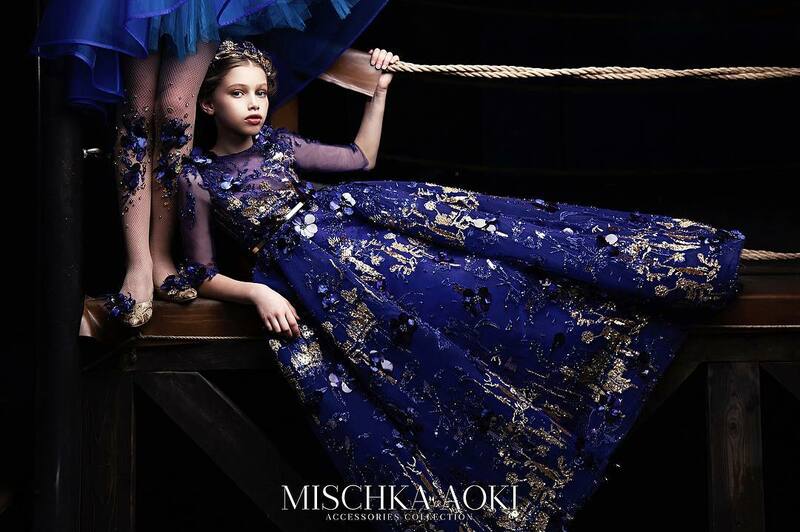 Rykiel Enfant was born. 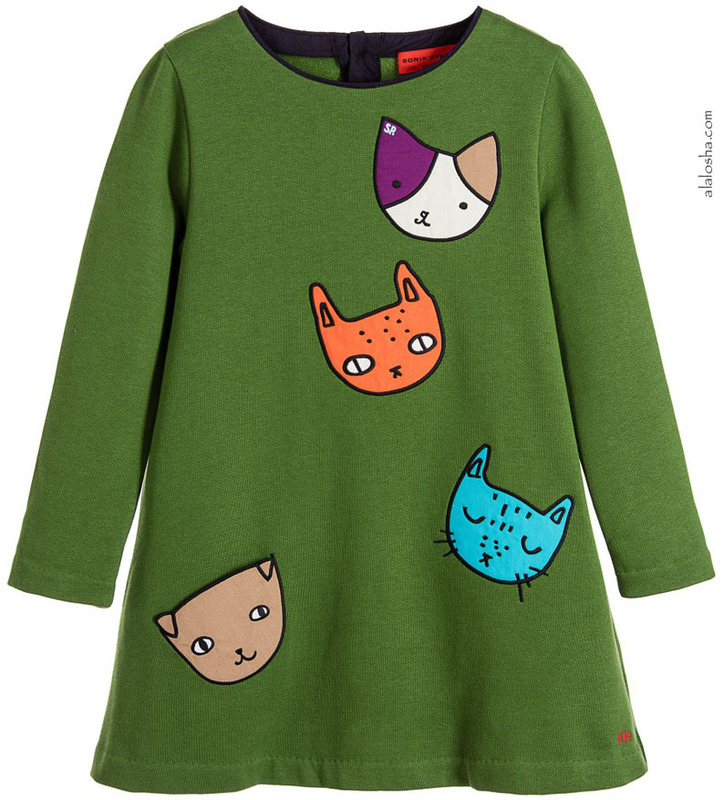 Lovely green dress, featuring colourful cat appliqués. With a cute cat pocket at the back of the dress, it is made in cotton jersey, has a soft, fleecy lining and a large, monogrammed button fastener at the neck. The Sonia Rykiel logo is embroidered by the hem in red. Girls gorgeous orange coat, featuring an ornate, monogrammed, double-breasted, silver button fastener. Made in a soft cashmere blend, there is a large, stripy, grosgrain ribbon in brown and beige running beneath the fastener, and a beautiful, silky, floral lining. There are two decorative front pockets and a vent at the back for comfort. 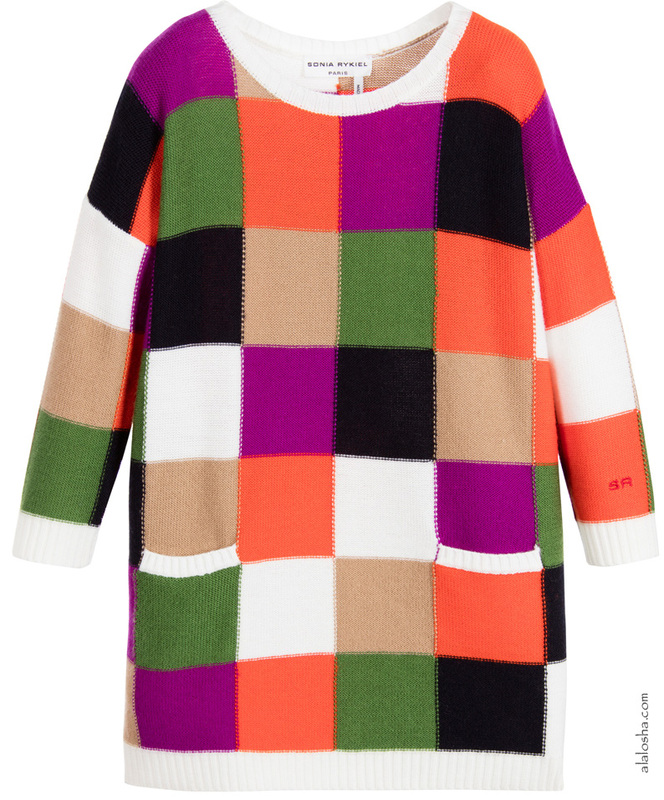 Girls colourful, beautifully soft and finely knitted sweater by Sonia Rykiel Paris. It has patches of orange, green, beige, purple, black and ivory, with exposed stitching. The collar, cuffs and hem are ribbed for shape and comfort and the designer's logo is embroidered in orange on one of the sleeves. There are two patch pockets on the front. 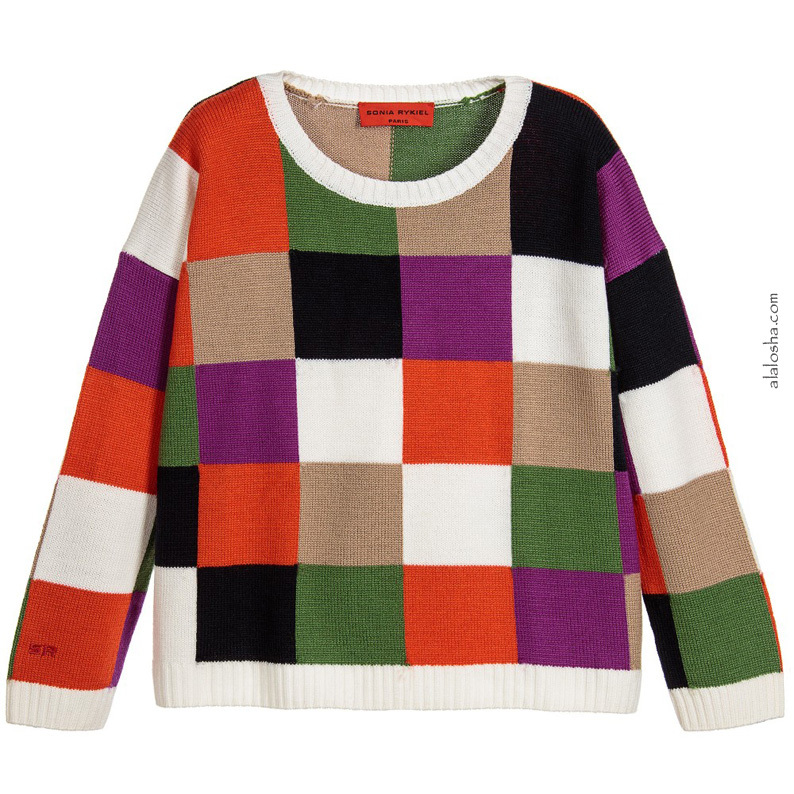 Girls colourful, beautifully soft and finely knitted sweater by Sonia Rykiel Paris. It has patches of orange, green, beige, purple, black and ivory, with exposed stitching. The collar, cuffs and hem are ribbed for shape and comfort and the designer's logo is embroidered in orange on one of the sleeves. 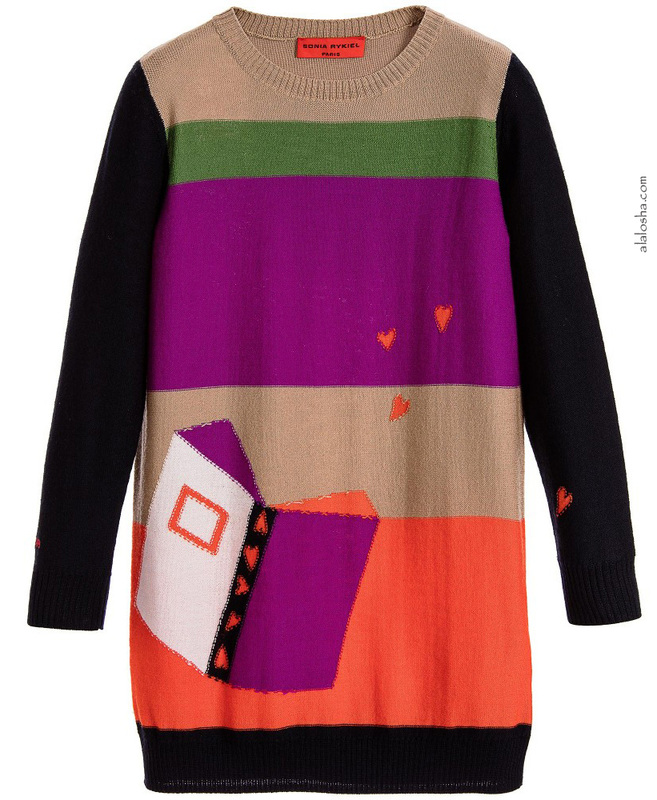 Girls colour block dress, featuring a book on the front with little hearts. Made in soft, finely knitted wool, this sweater dress has a ribbed neckline, cuffs and hem with the Sonia Rykiel logo embroidered in red on one sleeve. Easy to wear, it simply pulls on over the head.